The California Tortoiseshell, West Coast Lady, Red Admiral, and Golden Oak Hairstreak are just a few of the many butterfly species found in the floristically rich San Francisco Bay and Sacramento Valley regions. This guide, written for both beginning and experienced butterfly watchers by one of the nation’s best-known professional lepidopterists, provides thorough, up-to-date information on all of the butterfly species found in this diverse and accessible region. 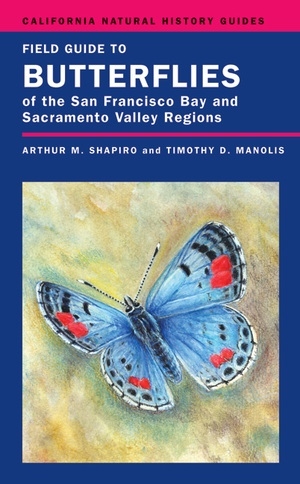 Written in lively prose, it discusses the natural history and conservation status for these butterflies and at the same time provides an integrated view of butterfly biology based on studies conducted in northern California and around the world. Compact enough for use in the field, the guide also includes tips on butterfly watching, photography, gardening, and more. Arthur M. Shapiro is Professor of Evolution and Ecology at the Center for Population Biology at the University of California, Davis. Tim D. Manolis is an artist, illustrator, and biological consultant and author of Dragonflies and Damselflies of California (UC Press).